William the Dog Trainer: What to do with a dog who is malnourished or underweight. What to do with a dog who is malnourished or underweight. All too often, we , as dog lovers we have to care for malnourished or underweight dogs. Sometimes it is a result of some sort of illness. Sometimes we take in a stray or adopt/foster a little guy or girl who has simply not eaten regularly in quite some time. 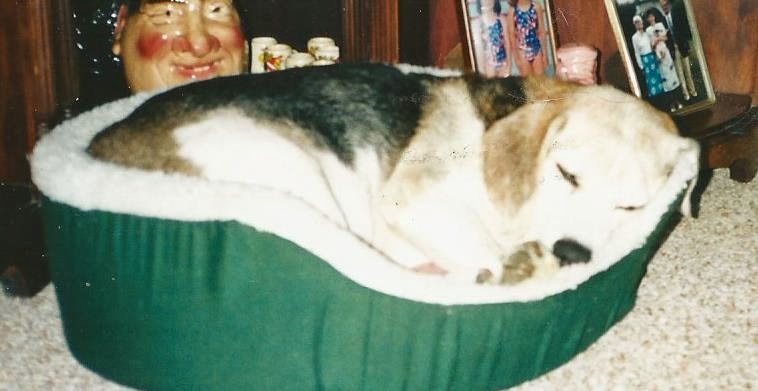 As many of you know, in the early 1990s I adopted a sweet beagle from the Dekalb County (GA) Shelter. He was a 9 month old anxious little guy named Boomer. Boomer was my companion until he died of renal failure at the age of 15 years. We had lots of fun together and I learned a great deal about anxiety issues in dogs from working with him. When he was about eight years old, I was working as a Computer Network Engineer/Consultant at a now defunct company in Sandy Springs, GA called Consultec. Boomer got sick. I do not remember exactly what the health issue was now but a nasty side effect was that he lost a lot of weight very quickly. I could see all his ribs and some of his backbone. His normally extremely healthy appetite had disappeared. He would not touch any of his favorite foods. This was very unusual for him and just not at all beagle-like. At the time, I lived in Marietta, GA. Dr. Tyler Huhman and Dr. David Lawless at Tritt Animal Hospital in Marietta, GA were the veterinarians that helped me to care for Boomer and a few cats that lived with me at the time (or maybe I lived with them.... you know how cats are ). The guys a Tritt did an excellent job treating Boomer's illness! However, the home care was my responsibility. I think it was Tyler who told me that the most important goal I needed to have was putting weight on Boomer quickly. I believe it was at his suggestion that I used Nutri-Cal in an attempt to stimulate his appetite and to load him up on the calories and nutrients that he desperately needed. I think Tyler gave me (or sold me, I don't recall) some prescription food that was formulated to help him gain weight (if I could get him to eat it). malnourished when he got to the Shack. If you notice a rapid weight loss, please, consult a really good veterinarian. There is generally an underling cause that probably needs to be treated. If your dog is not eating foods that he normally loves, if it lasts more than a day or so, you should really strongly consider taking him to a veterinarian. Once you have any health issues treated, it is your responsibility to care for the little guy or girl. You must be diligent about it! Always remember that your veterinarian will be more than happy to talk to you about methods that you can use to get him/her to eat. If your dog is not making progress, do not hesitate to contact your veterinarian for guidance! I mentioned Nutri-Cal earlier in my work with Boomer. Nutri-Cal is a high calorie vitamin paste. There are other similar products on the market. Most large pet stores (i.e. Petco, Petsmart, etc.) have their own store brand products that are labeled for the same use. When I worked at Petco, I found that our vitamin paste was good but some really picky dogs seemed to prefer the taste of the Nuti-Cal product and the price difference is not huge either way. In many cases the dogs will eat this stuff right out of the tube. However, in many cases you have to put it on the food. In Boomer's case, I put some of the stuff on my finger and sort of stuck it to the roof of the mouth to get him started. It is really sticky and he had to lick it off the roof of his mouth. He did not really like this but it worked. I decided to write about this subject today because, The Lovely and Awesome Shane and I are working with our new foster boy, Sammy on the same issue. He is very thin. His ribs and backbone are clearly visible. I am happy to report that he is beginning to get his appetite back! This morning he actually finished his entire bowl of food for the first time since he got here three days ago! If you have a dog who needs to gain weight, it is not a hopeless problem! It can be very frustrating but, there is hope and it feels really good to see a little guy or girl finally eat and gain weight! Our foster girl Penny the Tiny Beagle had the same issue. She gained a little weight we she was with us. 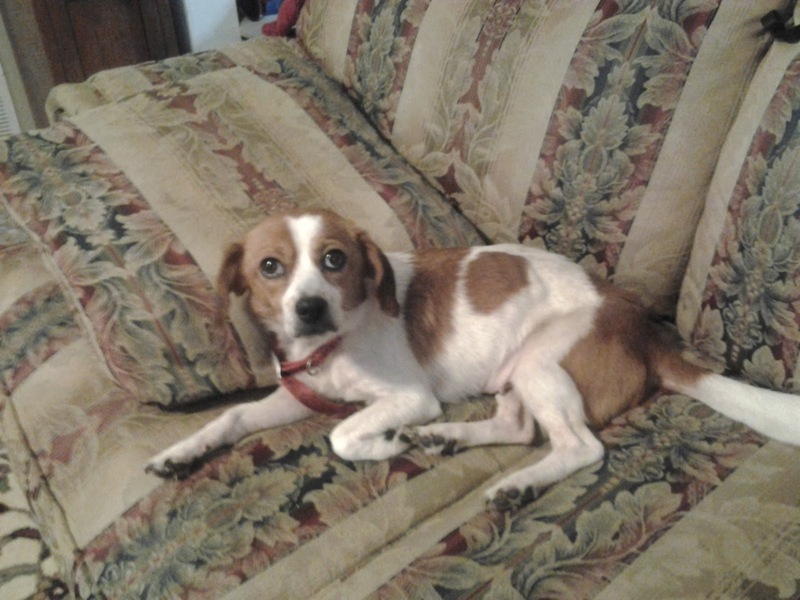 I saw her with her adopted family recently and she looks great!! If you have questions about getting your dog to eat please contact me! Also contact me if you need help teaching your little guy or girl to be a polite dog. I always tell you: " Polite Dogs = Happy People". Let me help you get happy today! Do dogs sense when their pack mates are sick? 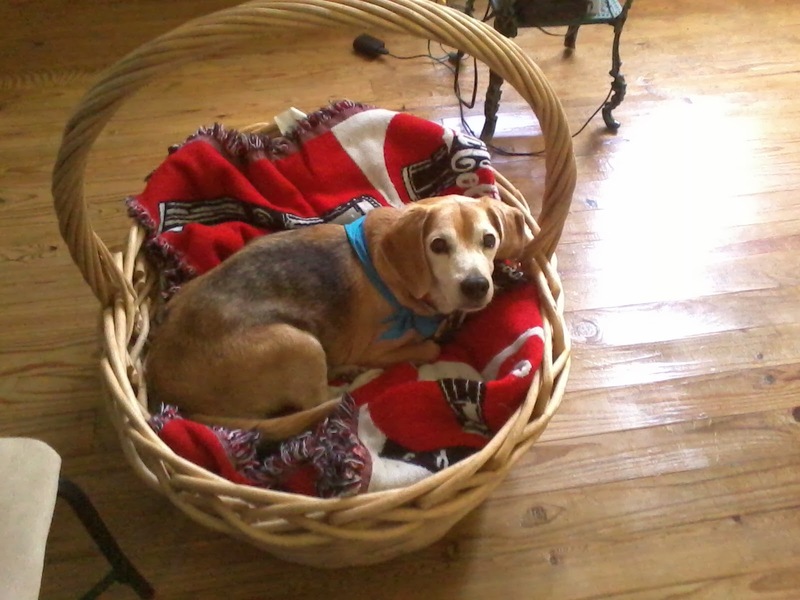 Welcome Foster Boy Charlie the Beagle!